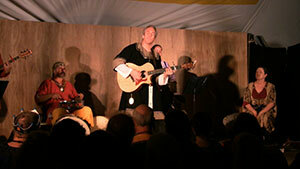 On Tuesday night (August 5th, 20124), Ken and Lisa Theriot took the stage at the Pennsic (SCA event) Performing Arts pavilion to a packed house. Joining them in the concert as always were Michele Buzbee, Kevin Valiquette and Robert G. Ferrell. Ken Theriot released his new album, Outlaws and Bystanders, in March of 2014 at the SCA event, Gulf Wars, in The Green Dragon Tavern. Tuesday night’s performance featured the same set list, which primarily consisted of songs from the new album, along with the mandatory earlier-album favorites such as Agincourt, Band of Brothers, Fifty Miles Into The Main, Son of The Sea, The Feast Song, and Harvest) mixed into the 2-hour performance. Lisa Theriot also performed her latest song (not yet recorded) called “Tomorrow,” which is the tale of and Shahrazad and Shahryar (The Book of the Thousand Nights and a Night). SCA audiences are always kind and supportive, but this time it was beyond anything we’d seen before. Maybe it was their two-year absence from Pennsic (medical issues and bad timing), the later time slot (9pm-11pm), the new album, or a combination of those factors. But (to quote Dan Fogelberg) “the audience was heavenly.” There was even a standing ovation and demands for an encore! Although this was a slight problem, since they had not built an encore performance piece into the show. So you learn something new every show! Have a rehearsed song or three ready to go should the audience have such a great time, AND there is available time left for an encore.